The Chance Building is named by Iris' sister gold mining town, only two miles from Iris toward Gunnison. Each mining camp had a post office, stores, hotels, saloons, livery and feed stables, blacksmith shop, assayers and mining engineers and surveyors. This building houses unusual collectibles including dolls, kachinas and music boxes. 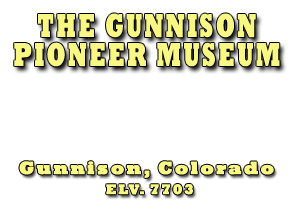 The Iris Building is named for a gold mining town that was located in Saguache County, 14 miles southeast of Gunnison. The population reached 1,000 by 1894, but by 1903, was nearly a ghost town. This building displays model cars, trucks, trackers, trains, planes and aerospace. 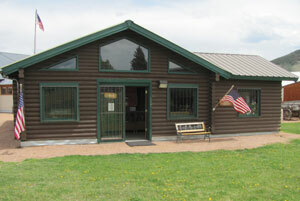 This building was the ice skating warming house west of the museum and was donated by the City of Gunnison in 2008. The building is dedicated to John A. and Phyllis W. Jordan for their generous donation to the Pioneer Museum on September 12, 2008. The building houses military uniforms, posters and memorabilia from the veterans of the Civil War, World War I, the Korean War and Vietnam, including an extensive World War II exhibit, donated by Don Fisher in 2009. The American flag dedication room is a must see for veterans and their families.